I wrote this article for the Racer Insider in February of 2014. Payne wound up breaking Lamont Sleets' single season record for total points scored. And after a stellar sophomore season he made himself eligible for the NBA draft. Cameron Payne is doing something that is almost unparallelled. With three games left in his freshman season he is averaging 15.2 points. Freshmen just don't do that at Murray State. Of all the great players who have worn the Blue and Gold only Lamont Sleets has averaged more points (16.8) than Payne as a freshman. Canaan is clearly one of the Racers' all-time greats, a certain Hall of Famer. Is it possible that we have another all-time great running the floor at the CFSB Center? Only time will tell. 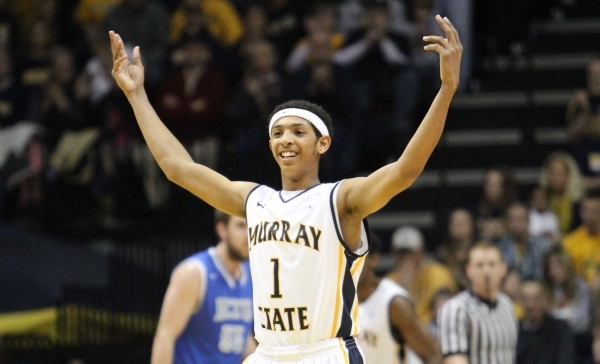 Payne grew up in Memphis, a basketball town, a town that has sent its share of players to Murray State over the years. “I started playing basketball when I was three years old. I played football too. I was a little chubby, so I played tight end,” he said, laughing. “I was chubby, so they put me on the line. I was still chubby when I got to high school. And I never really lost weight. I just got taller and it stretched out. Payne played high school basketball at the Lausanne Collegiate School for head coach Kenneth Wright. “He was a point guard himself,” Payne said. “He's very cool. We have a very good relationship. He played at North Carolina and he taught me a lot about being a point guard and helped me get ready for college.